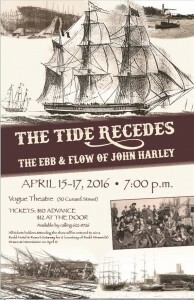 We’re excited to announce our next event in commemorating the 150th anniversary of the end of shipbuilding on the Island, a theatrical production, The Tide Recedes. This semi-biographical presentation pays tribute to John Harley, Beaubears Island’s final shipbuilder. Harley, who arrived in Miramichi from Ireland in 1823, built more than sixty ships on the River, all of exceeding quality, and partnered with industry giants like William Abrams and George Burchill, all the while becoming an icon in his own right. Join the cast as John rises as a master builder in Rosebank, and see him shepherd the Island through the decline of the shipbuilding industry. Hi -are you having a show in mid September. John harley is the brother of my 3 great grandfather William Harley, land surveyor. I live on Vancouver Island but will be in miramichi in September. I am honored that John Harley has been recognized.